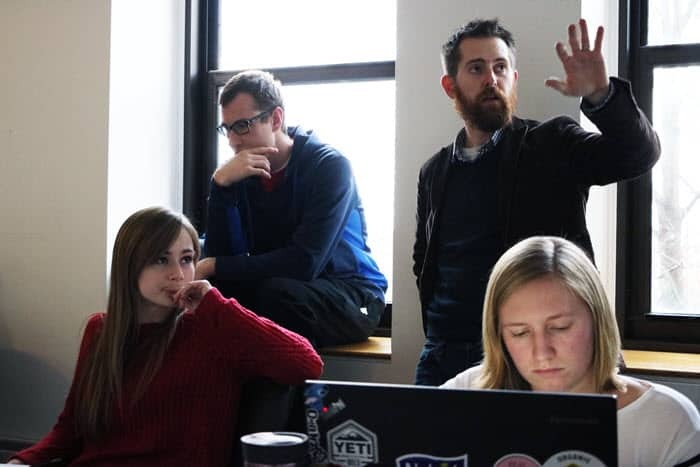 If I were to design the perfect learning experience, it would have all the components that Chad Kraus included in a studio architecture class he taught this fall. Chad Kraus with a prototype of the Haitian center his students designed. Start with a problem that has no single or simple solution. Study the problem, the context and the people involved. Learn the skills that will help solve the problem. Practice the skills with teammates. Get feedback from instructors and peers. Apply the skills in an authentic assignment. Teach others the skills you have learned. The project in Kraus’s class, ARCH 600, even goes beyond that, though, by adding a study abroad component. In a little over a week, Krauss and another professor, Lance Rake, and six students will board a plane for Miami and then fly to Haiti, where they will spend two weeks helping build a community center the class designed. Kraus’s class, called Global Studio, has been creating, prototyping and revising plans for the community center all semester. The class has 12 students, though only six will travel to Haiti. Kraus, an associate professor of architecture, is the lead instructor for the class. He has been joined by Kent Spreckelmeyer, a professor of architecture who directs the school’s health and wellness program; and Rake, a professor of design. Cécile Accilien, associate professor of African and African-American studies and associate director of the Center for Latin American and Caribbean Studies, taught an accompanying one-hour class that helped students learn about Haiti and its culture. That’s only a small portion of a cast of instructors, students, consultants, fundraisers, planners, engineers and organizations that has been involved. The School of Architecture and Design raised more than $12,000 through a crowdfunding campaign to help defray student travel costs. Students and faculty at the American University of the Caribbean, and Haiti Tec, a trade school in Port-au-Prince, will join the KU team at the building site. Frank Zilm, who leads the Institute of Health+Wellness Design at the School of Architecture and Design, has been involved, as well. All of those involved have been working with the Global Birthing Home Foundation, a nonprofit organization based in Leawood that is financing the construction. If that sounds like a challenge to plan and coordinate, it is. And yet Kraus approaches the project with a quiet equanimity that leaves little doubt that all the pieces will fit together. Chad Kraus critiques final plans for the building project. With him are Kenneth Wilson (in windowsill) Melissa Watson (in red) and Sarah Wages. The new center will be built in Torbeck, a rural area near Les Cayes on the southwestern peninsula of Haiti. In 2016, Hurricane Matthew roared through the area with 140-mph winds and torrential rains. The area had few shelters, and 150 people took refuge in a birthing center in Torbeck. The center’s staff continued to offer all of its services – delivering babies, offering prenatal and postnatal care – even as they worked around the unexpected guests. “It was really difficult for them, and it sort of catalyzed in their mind the absolute necessity of building a community center,” Kraus said. The birthing center, Maison de Naissance, was established by the Global Birthing Home Foundation. The foundation shares oversight of the center with a Haitian organization, provides operating money, and handles all the center’s programs and operations. The foundation reached out to the School of Architecture and Design for assistance, and that’s when Kraus became involved. 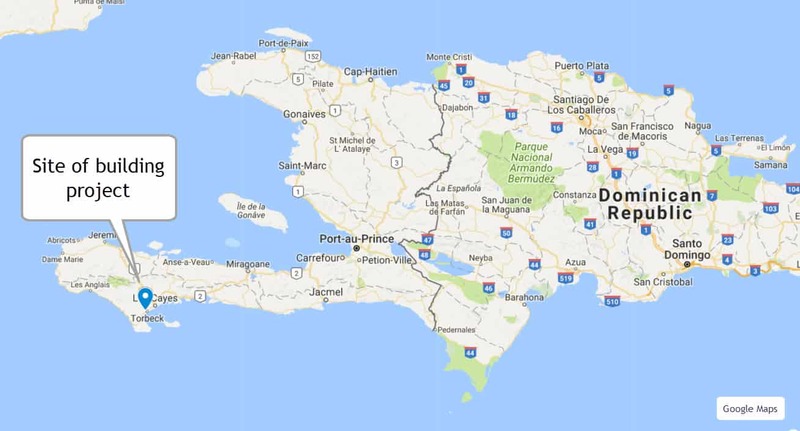 He and the foundation’s executive director traveled to Haiti during the summer to begin the planning process. “They were looking for a way to build a strong, stable, long-lasting, secure building,” Kraus said. To do that, Kraus and the students settled on rammed-earth walls and a bamboo roof. Rammed earth, which has been used for centuries, is just what it sounds like, Kraus said. A wooden form is constructed for the walls, and then soil mixed with a little water is added and tamped down with wooden dowels or specialized tools with steel butts. Kraus learned about compressed earth while working for the Pritzker-prize-winning architect firm Shigeru Ban, who is known for his unconventional designs. 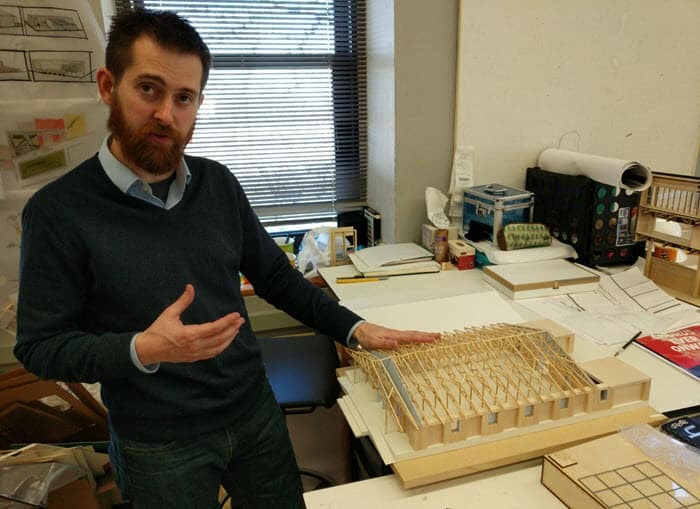 He taught a studio focusing on rammed earth after he came to KU and found that students were especially interested in the techniques. He doesn’t want to teach the same studio every year, he said, but students continually ask to learn about rammed earth. That approach fit well into the designs for the community center in Haiti. A prototype of a rammed earth wall that students created. The class chose bamboo for the roof because bamboo is lightweight, flexible, and resilient in high winds. Lighter material reduces the danger of heavy objects flying through the air during a hurricane or falling during an earthquake. Bamboo is also a renewable resource. It grows quickly and its roots spread, providing cover for erosion-prone areas where forests once stood. Half of Haiti’s forests have been destroyed since the early 1900s through logging, clearing of trees for coffee and sugarcane fields, hurricane damage, and demand for land as the country’s population has grown. President Rene Préval introduced bamboo into the country in the late 1990s and early 2000s as a means of land cover and industry. The project that Kraus’s students have designed uses renewable materials and has the potential of providing jobs for the surrounding community during the construction process. They also want to demonstrate how the same process can be used to build resilient homes with low-cost materials. The students in Kraus’s class have worked in teams throughout the semester. A management team oversaw the broad aspects of the project, working with a design team, a research team, a budget team and a video team, which is creating instructional videos to demonstrate the building techniques for Haitian workers. The teams researched similar projects for details that might improve the center’s design or offer clues about how the materials they are using will stand up in Haiti’s climate. Each new aspect raised new challenges or led to questions the students had to research, Kraus said. 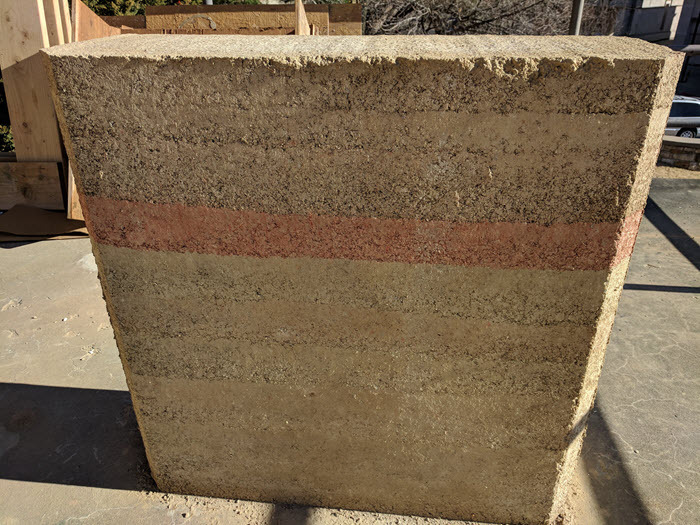 How does the rammed earth meet the foundation? How do we size the foundation? How much rebar do we put in? How we design the bamboo to be flexible but also stiff? How do we apply cross bracing between the bamboo trusses? How do we anchor the rammed earth? How we design the roof so that it doesn’t blow away? How do we build a latrine that can be maintained over time? What colors and materials will fit best into Haitian culture? The students have checked in frequently with the Global Birthing Home Foundation, as well as contractors and engineers in Haiti. They have drawn on experts in Lawrence to help answer questions about designs, and costs and availability of materials. For instance, Ron Barrett-Gonzalez, a professor of aerospace engineering, helped the students understand how to design a roof that will stand up to high winds. An engineer in Ireland who has extensive experience with bamboo construction has spoken with the students remotely. Sarah Wages, a fourth-year student from Lake of the Ozarks, Mo., said those demands could be overwhelming at times. Students in ARCH 600 discuss building plans during their final meeting before the trip to Haiti. 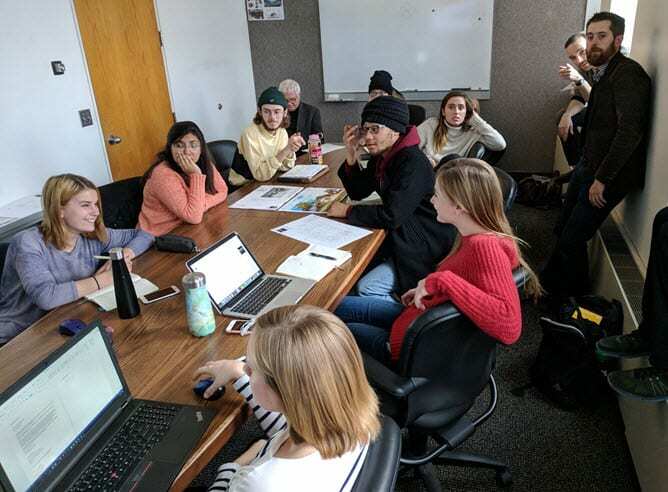 During the last week of fall classes, the project team gathered in room 206C in Marvin Hall and ran through the final details. 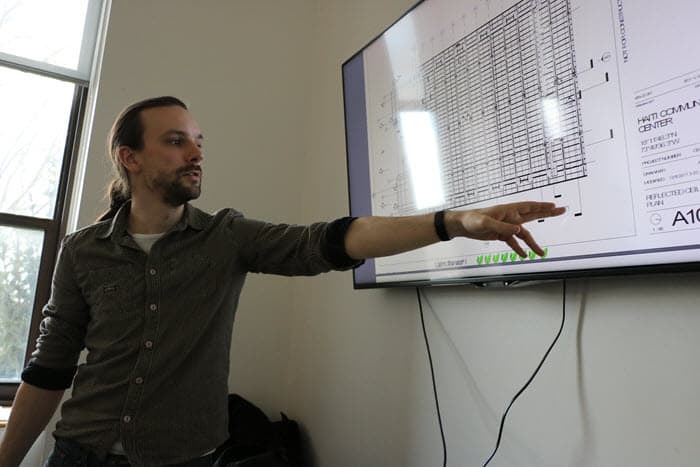 David Vertseeg points out some problems in the building plans. The room was warm and stuffy. The overhead lights were turned off, and a gray light from a cloudy December afternoon filtered in through three north windows. Students, many in sweaters, sweatshirts and stocking caps, huddled around a conference table. One sat on a window ledge, another on the floor. Some had laptops open. Others had building plans spread out in front of them. Students projected their plans onto a large monitor at the end of the room, and Kraus and David Vertseeg, a post-professional student who is working with Kraus in a special problems course, asked questions and offered suggestions. Remove an extraneous line from one drawing. Reduce the amount of ground showing on another so the notations can be seen. Adjust the hatch size of the background fill so that it conforms to the plans. What are those black lines in that section of the pony wall? Where does that downspout go? Do the drawings indicate rebar in the walls? Make sure the plans have consistent numbering for the contractor. Zilm, of the Institute of Health+Design, reported by speaker phone on results of a test of the Haitian soil. It has about 14 percent clay, on the low end of what is needed, but it should be enough to provide stability for the walls, he said. Considerable time was spent going over travel details questions. Can we take batteries? What is the weight limit on luggage? What tools do we need to take? Would the birthing center know the cheapest way to ship tools we can’t get in our bags? Instisar Tyne listens to Kraus as Melissa Watson (foreground) takes notes. Spreckelmeyer asks whether all the students have a contact card for the Study Abroad office. Kraus tells them that wifi in the area is spotty, so phone use will be limited. Don’t take selfies with people or treat them like objects of art, he says. Make sure to bring a water bottle. Take nonperishable protein. Get a good sun hat and powerful bug spray. Take a small amount of cash but not so much that you become a target for thieves. Wages is the last to leave. I ask her what she has taken away from the class. She talks about the technical elements (repeatedly revising designs, testing the rammed earth techniques, deciding on the best way to create shutters) but also the cultural elements (adding red pigment and other colors to the walls to accommodate Haitian tastes, making sure the project will help people in the long term). Kraus, along with Spreckelmeyer, will lead another class in the spring related to the Haiti project. Students will continue to work with the partners in Haiti, troubleshooting problems and offering advice on components of the community center. They will also develop prototype housing designs based on the plans they created for the center. The emphasis will again be on rammed earth and bamboo. 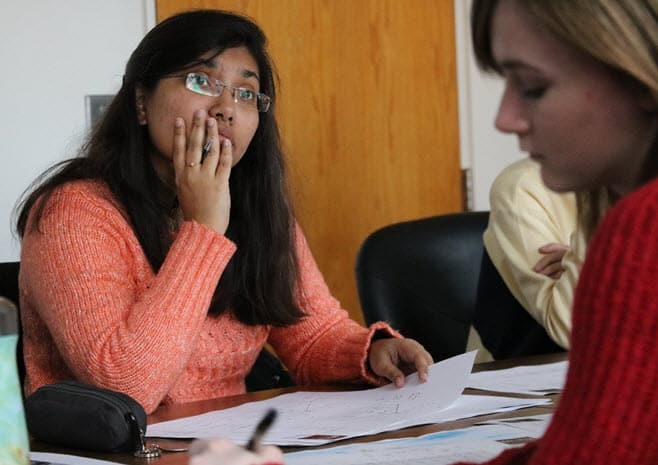 Some of the students from the fall class and the intersession will continue, but additional students asked to join after they heard about the project. 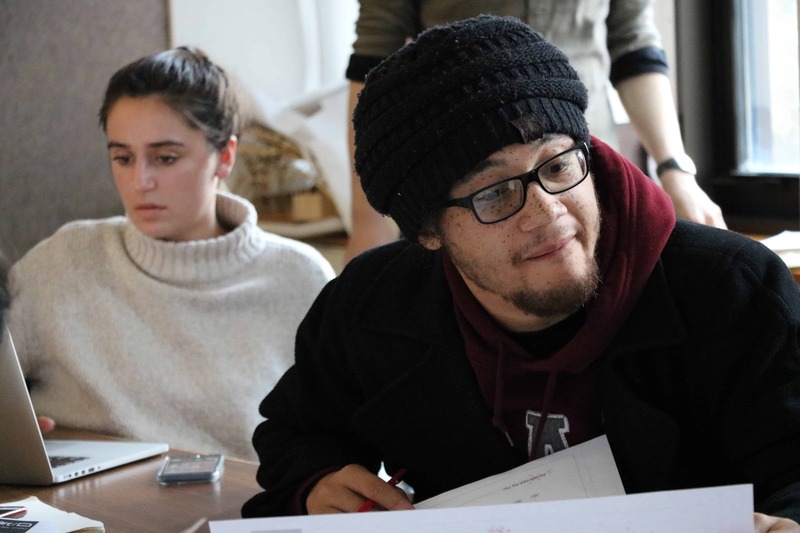 Some of the students will eventually earn 13 hours of credit for the Haiti project: three from the fall architecture studio, one from the class on Haitian culture, six for the Haiti trip, and three in the spring class. Schuyler Clogston and Sekou Hayes work during the final class session. 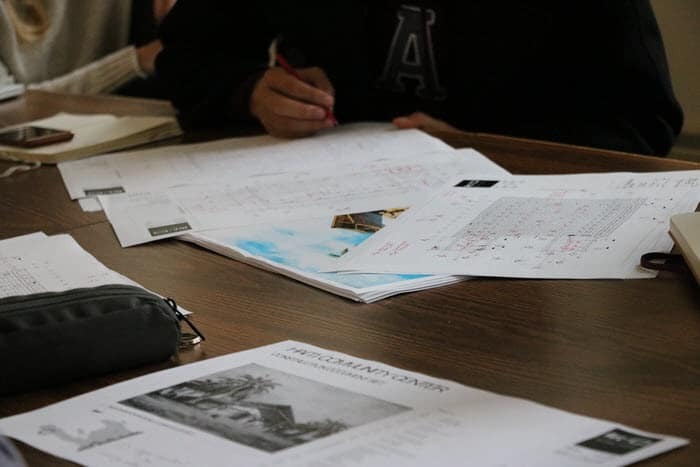 Architecture classes regularly have a hands-on component, with students designing and building structures or additions, or renovating existing buildings. And all architecture students, who go through a five-year program and earn a master’s degree, are required to study abroad at some point. This class is different, though, because it combines the elements of a design studio with a study abroad. I told Kraus that I was impressed with the format of the class. It provides an amazing number of learning experiences for students, helping them turn the conceptual into the tangible and then see their work put to use for a good cause. Tagged active learning, authentic assignments, service learning, study abroad.